As a college student, skincare is probably one of the last things on your mind, but "stress" is a word that's probably familiar to you. (Any fellow engineering majors out there?) Late night studying, paper writing, stress eating, whatever it may be...it can have a huge impact on your skin. I've been told by older ladies that girls my age have no place to talk about wrinkle prevention and skincare, but after visiting multiple dermatologists and speaking to ladies with beautiful skin, I've learned it's never too early to start. I've been a huge fan of Supergoop! products for years, and after playing around with some of their products they kindly sent over, I wanted to share some tips with you on how to take care of your skin when you're a studying, busy bee with limited time and space. This sounds a bit silly, but I decided to perform my own little skin experiment this semester. In the span of a few weeks, I followed all the tips I'm about to share with you below. My skin looked better than ever, and I felt less of a need to wear makeup. After those weeks, I purposely decided to sleep later, eat late at night, and drink more sugary drinks just to see if it really would have a negative affect on my skin. Oh, it sure did. I'm still recovering from my few weeks of skin debauchery. You've heard this time and time again, but drinking water really does make your skin look better. It helps flush out toxins and makes your skin look plump. I find that carrying around my Hydro Flask Insulated Bottle everywhere I go is the best way to stay hydrated. Water can taste really boring to me, so adding a few lemon wedges to my bottle before I leave for classes really helps me drink more. 2. Get 10-15 minutes out in sunlight without sunscreen. I know girls that can't stand being under the sun, because they're convinced it's bad for their skin. I also know girls that bake underneath the sun for hours to get their tan on. Both aren't good. You don't want vitamin D deficiency, and you definitely don't want premature wrinkles. Getting 10-15 unprotected minutes of sun every day can actually help you get healthy skin! 3. Find skincare/makeup products with SPF. If you walk or bike between classes in college, you're probably outside for more than 10-15 minutes a day. Enter SPF. 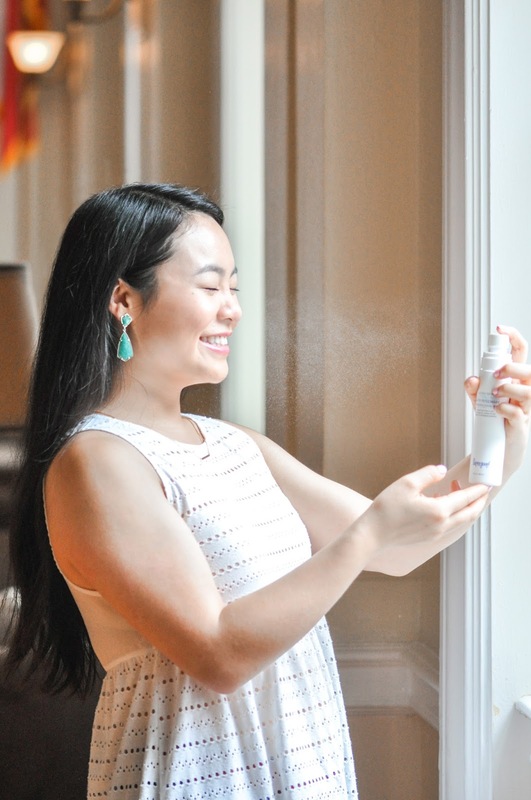 Nothing beats a classic sunscreen, but the most convenient way for me to get my SPF fix is by using products that have built-in sun protection. It's also super important to reapply if you're gonna be out all day (music festivals, day parties, sporting events, etc.) As a college gal, I love products that are multi-purpose, because they save me time and counter space. The Supergoop! Defense Refresh Setting Mist SPF 50 above is perfect for SPF reapplication, but it also locks my makeup in place, and controls shine. Also, the rosemary and mint extracts in this smell really good. Just make sure to avoid getting it in your hair! This right here is the Supergoop! Daily Correct CC Cream SPF 35+. I've shown this before in my everyday makeup favorites, but y'all, this stuff really is amazing. Ever since I discovered it in high school through Birchbox, I can't seem to find a better replacement. It's perfect for busy girls, because it basically combines your skincare and foundation into one step. I use the shade Light-Medium, and it does a wonderful job blurring out imperfections, neutralizing redness, and minimizing inflammation. It's packed with good stuff like essential fatty acids and apple extract to brighten your skin and give you perfect, light everyday coverage with just your fingers. Beware though...this stuff is basically waterproof, so make sure to wash your hands and wipe them with a disposal paper towel, so you don't stain your normal ones. Unlike the CC Cream, this Supergoop! Shine On Lip Screen SPF 50 was completely new to me when I first received it, but I'm now hooked on this little guy. Most people don't realize their lips also burn in the sun, especially when wearing glossy lip products, because they actually magnify the sun's UV intensity. The idea of old, wrinkly lips makes me shudder, so this product is a great buy for you girls who need sun protection for your lips. This stuff isn't sticky at all, doesn't have a funny taste, and turns any lip shade into a perfect, summery gloss. Again, I'm hooked on it. My mom always told me if I love myself, I need to sleep more. Seven or more hours of sleep seems impossible in college, but it can be done if you prioritize it. When you give your body more time to rest, it really does make a huge impact your skin. More on this in an upcoming blog post in my College Survival Guide series! It's important to use good things for your skin, but it's just as important to put good things into your body. I love snacking, and I definitely get the study munchies. My rule of thumb is to stick to the perimeter of the grocery store and buy things that are perishable, meaning that they'll actually go bad. For something savory, I like veggies and hummus instead of chips, and for something sweet, berries and a few pieces of dark chocolate do the trick. When you eat well, you feel good, and your skin will show it. 6. Take your makeup off ASAP. If you're coming home from a long day of classes, and you don't plan on leaving afterwards, there's no reason to wait until the end of the night to take off your makeup. If you live in a place like Austin, you understand the end of the spring semester can get really hot. Sweat, germs, and makeup sitting on your skin for a long period of time is sure to clog up your pores and cause acne. I think it's best to just wash it off as soon as you can to avoid future skin mishaps. Thanks so much for reading, y'all! I hope these tips were helpful. Please let me know down below if you have questions or comments! Thanks to Supergoop! for kindly sending over products for review. This post is not sponsored. All opinions are my own. No measure of good school examine tips will enable website you to succeed in the event that you are not going to utilize them in any case.